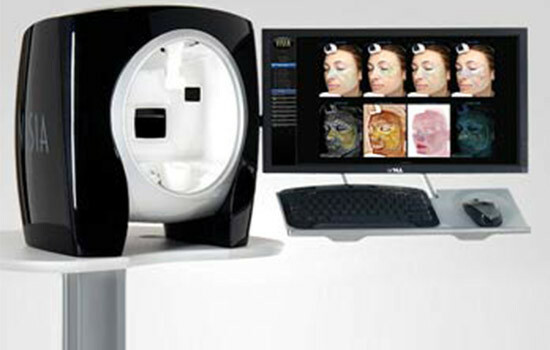 The Visia Skin Complexion Analysis offers patients an objective evaluation of skin health. By providing a comprehensive photo-assessment, Visia allows an individualized treatment plan to be developed for each unique patient. The best in-office and at-home therapies can be established to provide long-term results. Visia Skin Complexion Analysis takes the guesswork out aesthetic treatments, by establishing a detailed look into the patient’s complexion. Results from the procedure will show the percentage of existing wrinkles, large pores, sun-damaged skin cells, and age spots; as well as the presence of bacteria on the skin, notorious for causing facial acne. Visia Skin Complexion Analysis will also provide a valuable glimpse into how the face will age with and without future treatments. Visia Skin Complexion Analysis can benefit everyone, from 18 to 80. A solid assessment of preexisting damage and future aging allows each patient to receive a customized aesthetic plan, specifically designed for their unique situation. Visia takes only a few minutes in the office. The quick procedure is completely pain-free. No creams, lotions, or solutions are required. Using cutting-edge technology, our expert esthetician will use a computerized camera to obtain a clear ‘picture’ of the skin’s health. Once the Visia Skin Complexion Analysis has been completed, patients will sit down for a one-on-one consultation appointment with one of our experienced estheticians. Together, the images of the skin will be reviewed, along with a thorough explanation of the results. We will explain all of the fitting treatment options to reach optimum skin health. The esthetician will then formulate a unique treatment plan, designed to reach the specific needs and goals of the specific patient. An initial Visia Skin Complexion Analysis does more than illustrate the current condition of the skin; it also acts as a baseline for future evaluation. As time goes on, a repeat analysis can be performed to determine if the skin care regime is making appropriate progress and if any new damage has occurred. At your next appointment, talk to an esthetician about the Mirror Mirror Beauty Boutique’s complimentary Visia Skin Complexion Analysis. We will be happy to explain exactly how Visia Skin Complexion Analysis can benefit you.